Two outstanding attributes of the cougar is their remarkable agility and ability to ran extremely fast. As territorial animals, a cougars domain can be anything from 25 sq miles (65 sq km) to 1000 sq miles (2500 sq km). They mark their territory by scraping together urine, dirt, and leaves. 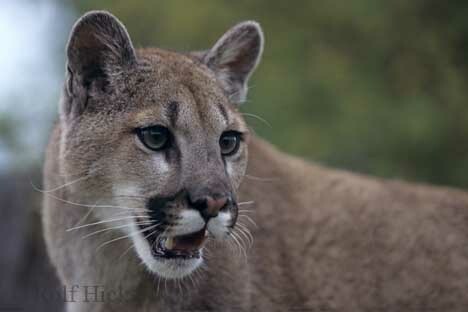 Cougar, Felis concolor, also commonly referred to as mountain lions or pumas, Vancouver Island, British Columbia, Canada. Picture of a Mountain Lion, Felis concolor, on the look out on Vancouver Island, British Columbia.